Both public transportation and personal cars are geared towards transportation of individuals, and small groups. When it comes to transportation of groups of more than six, the options are severely limited. The only viable option in most circumstances is to split up the group, and this poses its own challenges, inconveniences, and risks. 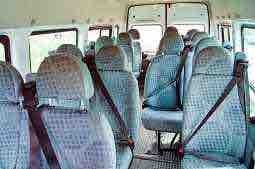 Our Bradford minibus hire service offers the best vehicles in town for group travel. 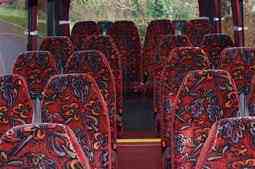 We offer you several good raesons to opt for our Bradford coach hire services. Large Fleet Size: Our We have a fleet of the latest and modern minibus and coaches, including Ford Transit, Mercedes 16 seater, Volvos, and Iveco coaches. 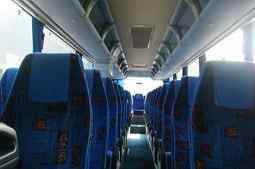 We have vehicles of several seating configurations, meaning that your group can travel comfortable, in a reliable vehicle. State of the art amenities: All our vehicles come fitted with modern gadgets, and include other amenities. The standard features on offer include powerful air-conditioning, large comfortable seats, and on-board entertainment system. We also offer special services, such as on-board snacks and refreshments, on special request. Some of our vehicles have on-board toilets and other amenities as well. With us, the travel becomes a pleasurable experience on its own. Reliability: Over the years, our Bradford minibus hire service has earned for itself a reputation for reliability. All our vehicles are modern, with little chance of breaking down. We furthermore subject all vehicles to periodic routine maintenance, make any repairs promptly, change tyres and engine oil on time, and do everything else to ensure that your trip is not hampered by our vehicles breaking down en route. We also make it a point to hire local drivers, who know their way around town, and are familiar with all place names, so that time is not wasted asking for directions, or navigating a route full of choc-a-bloc traffic. We hire skilled and experienced drivers, and further train them in all nuances of driving and customer care. Safety is our number one priority, and we always make it a point to obey all traffic regulations, and pay heed to all safety considerations. Flexibility: What makes our minibus hire in Bradford even more worth its while is the flexibility we offer in our service. The flexibility starts at the very beginning when you may approach our customer support team, to get a customised quote that suits your specific requirements and budget. We are amenable to accommodating any special requests making any change, to the extent possible. Ease of use: We are available round the clock, and have an easy and seamless online booking process. You may get an instant quote using the booking form available at our website, or you may contact our customer support team through live chat, phone, or email. Award Winning Customer Support: Our customer support team goes all out to deliver high quality professional services. Total customer satisfaction is our guiding principle, as evident by the large n number of return customers and glowing testimonials left by customers who have used our services. Low costs: Our unmatched Bradford minibus hire offerings come at guaranteed low costs. We do not cut corners anyway and deliver top-north and comprehensive superior service, at the lowest cost. Bradford in West Yorkshire lies 8.6 miles west of Leeds, and 16 miles northwest of Wakefield, and has a population of 522,452 (2011 census). Though the city’s once thriving textile industry is in decline, the town is undergoing redevelopment, and has a strong service economy now. A plan to regenerate the Bradford city centre, including the Broadway shopping centre, is underway. The major connection between Bradford and the rest of England are the A647, A650, A658, and A6036 roads. The M606 spur connects Bradford to the M62 motorway as well. Leeds Bradford International Airport is 6 miles from the city centre. Of special interest in Bradford is the number of stately buildings. The best preserved medieval monument is the Bradford Cathedral and the Bolling Hall. The city has several monuments that are striking representations of the Victorian architecture, with the best being the City Hall. Other monuments of note include Cartwright Hall, St. George’s Hall, Fulneck Moravian Church, and the Bradford Alhambra. The town is home to several museums of note, including the Bradford Industrial Museum, National Media Museum, Bronte Parsonage Museum, and Peace Museum. The city also boasts of several parks, with the most popular ones being Bradford City park, Lister Park, Bowling park, Horton Park, and Peel Park. Bradford is a lively city with a host of well known festivals and events lined up throughout the year. The Bradford International Film Festival takes place at the National Media Museum, in March. The Bradford Animation Festival, UK’s longest-running animation festival, take splace every November, and culminates in the annual world famous BAF Awards. The Bradford Mela of June is now a popular event associated with the city. The city has a lively art, music, and culture scene. It is the home of many rock bands, and professional theatre companies. The city hosts several theatres, concert halls, and other venues for music and art. The St George’s Hall, dating back to 1853, is the oldest concert hall in Britain. Bradford was designated the world’s first UNESCO City of Film, in 2009. Bradford has a long sporting tradition as well, with Bradford Bulls, Based out of the Grattan Stadium, Odsal, being one of the most successful rugby league clubs world-over.